Every now and then we get a listing that is cut from a different cloth. 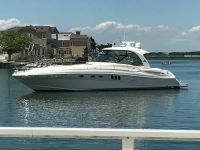 “Pair A Dice” is one of the cleanest 52 Sundancer I have ever seen and is equipped with over $60,000 in NEW Garmin glass touch screen color displays, NEW Garmin Autopilot, NEW Garmin VHF Radio and NEW Flir Thermal Night Vision Camera. “Pair A Dice” was delivered to her original owner on the sweet fresh water of the Chesapeake Bay and has returned to our slips in Kent Narrows, MD. She is turn key, new bottom paint, Zincs and fully detailed awaiting your inspection and survey. Please contact David Sheilds, Exclusive Agent, directly at 410-829-0080. Seller has found his new yacht and is eager for offers!